The club owns boats and equipment which is available for use by all members. The club has recently acquired a canoe and also has a range of equipment available to help members maintain their own boats both in and out of the water. A complete list of equipment can be found in the Club Documents section. Most equipment requires some previous experience before use, and all require care. For example, the pressure washer can cut wood – so use with discretion. There will always be a member that can provide advice. Other equipment (mainly the tractor and lifting gear and the safety boats) is restricted to use by qualified people for club purposes. Ask if you’d like to be involved as volunteers are always welcome. 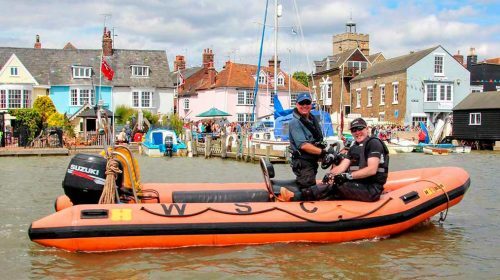 The RIBs and motor launch are also sometimes used, with WSC crews on board, to assist at external events such as Pyefleet Week and the Town Regatta.